← Thornley Avenue children, 1970. 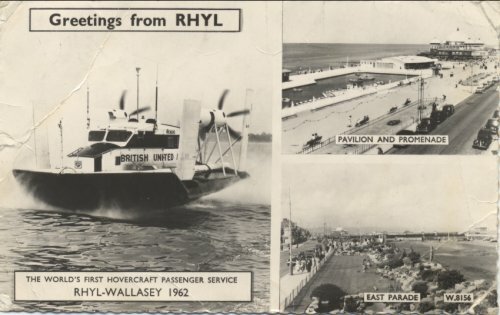 Those of us of a certain age will remember the excitement that the Hovercraft brought to Rhyl in 1962. Most books about the history of Rhyl include full details and technical specifications relating to the “Vickers VA-3 Hovercraft”. Here, however, are some extracts from the July editions of the Rhyl Journal which provide reports with a more local flavour. 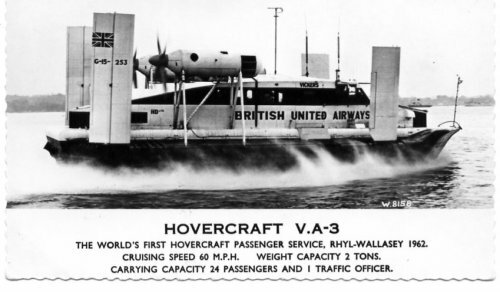 Now that Wallasey has given its wholehearted approval to being the Wirral terminal of the hovercraft service to be operated with the VA-3 by British United Airways in conjunction with Vickers-Armstrong and BP, final plans are being made for the service this Summer. The VA-3 will be based and serviced at Rhyl, but will be refueled at Wallasey between trips. A well known Rhyl man will be one of the refueling operators at Wallasey. He is Mr Meirion Evans, 43, Clifton Park Road, who recently completed 25 years service with Shell Mex and B.P. He has just spent a week at Southampton to get experience of the work of refueling, and enjoyed a two hours cruise round the Solent and Southampton Water in the hovercraft. Mr Evans, a native of Henllan, is well known in the sporting life of the town. He is the present secretary and former chairman of the Rhyl F.C. Supporters Social Club. Has the most modern form of travel no appeal to the people of Rhyl? While bookings for seats on the world’s first hovercraft service, between Rhyl and Wallasey – due to start on July 20th – have been pouring in from Cheshire and Lancashire, so far only about a hundred of 3,000 bookings have been made locally! Meanwhile from “the other end” bookings have been received from Rotary Clubs, Round Tables, Youth Travel Clubs, professional institutes and societies, a party of old people and another of children convalescing from polio! But if the majority of Rhyl people are just too busy to bother in the middle of the season with this landmark in the development of travel, Mr J. Ferguson, of North Wales Travel Agency, who are handling local bookings, has no doubt about the appeal it will make to visitors to the town. After Telstar, Rhyl’s residents and visitors have this week been privileged to see another “miracle” of scientific progress – the Vickers-Armstrong VA-3, which arrived on Sunday to prepare for the first scheduled passenger carrying hovercoach service in the world. Between Rhyl and Wallasey, at the tip of the Wirral, it is due to begin as an experiment on Friday. 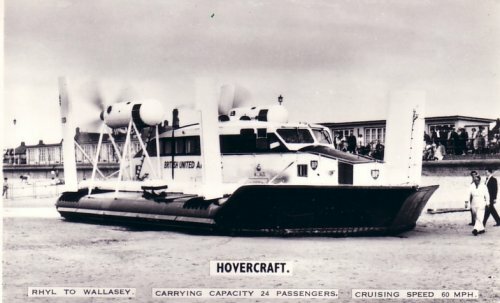 Brought from Southampton to the Mersey by boat, the hovercoach called first at Wallasey and was then driven to Rhyl by Mr Leslie Colquhoun G.M., D.F.C.,D.F.M., test pilot and operations manager of of Vickers-Armstrong hovercraft division. Throughout the early part of the week, both at its base at Horton’s Nose and throughout its trials, the hovercoach has attracted the interest of milling crowds. It has attracted, too, the attention of television and the national and world wide Press, and its value to Rhyl as a publicity medium is inestimable – apart from the prestige the town has received from being selected to play a proud part in the history of the development of travel. The Post Office in Rhyl are playing their part in officially marking the inauguration of the hovercraft service by franking letters with a special hand stamp. Mr H. Fenna, the Head Postmaster, states that on July 2oth only, all mail posted in a special temporary post box at Rhyl Post Office will be franked with the stamp. For the second time in exactly half a century the town of Rhyl, on Friday, experienced the unique distinction of being the “springboard” for a pioneering journey which should command a position of supreme importance in the history of travel, when George Medalist, Leslie Colquhoun piloted the Vickers-Armstrong VA-3 on the first “leg” of the world’s first commercial hovercraft service scheduled to run six times a day, six days a week between Rhyl and Wallasey, until September 16th, as a joint experiment between Vickers-Armstrong, British United Airways and B.P. It was just 50 years ago on April 20th, 1912, that on the beach at the Voryd – not many yards from the hovercraft base – the residents of Rhyl waved farewell to Vivian Hewitt as he flew off in his Bleriot monoplane to claim the honour of being the first man to to pilot a plane across the Irish sea. Youngest passenger was 21 months old Martin Jones, 128, Marsh Road, who travelled with his mother, Mrs Millie Jones, an usherette at the Odeon Cinema: his grandmother Mrs Jean Morris, and Mrs Morris’s 14 year old son, Tony, a pupil of Glyndwr County Secondary School, the first schoolboy to travel on the hovercraft. Mr Tony Ward of 13, Aquarium street, a popular figure as accordionist on one of the local pleasure boats a few seasons ago, and his 20 year old daughter Rosemary, cashier at the Odeon, who were among the first to book seats at the North Wales Travel Agency, were also among the passengers. All the passengers on the inaugural trip were besieged by Press and television reporters on arriving at Wallasey and found it impossible to leave the beach before the return trip. Plaques were presented to Rhyl and Wallasey by Mr Freddie Laker, managing director of British United Airways, on behalf of the three companies participating in what he termed “a breathtaking achievement”. 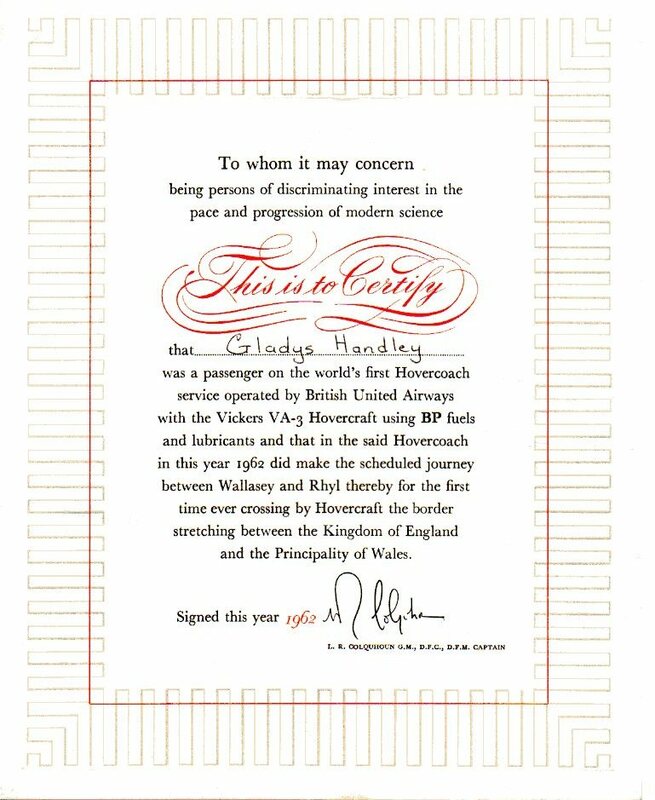 Mr Roger Handley has kindly sent us a copy of the certificate that his mother received after her free trip on the Hovercraft. Mrs Handley was the manageress of the Sports Cafe and got to know all the crew as they had all their meals there, even a farewell party with a cake in the form of a hovercraft! I was on holiday in Rhyl (from Upton-by-Chester) with my parents, July August 1962 and we always stayed with my Gran in Kinmel Street (near the Hanratty House). I well remember seeing the Hovercraft several times on the beach at Rhyl. I recall the noise of the machine and also the smell of “warm sand” in the area. My father who was hard of hearing detailed me to ask of a steward the fair for a round trip to the Wirral; the answer was £2 for an adult and £1 for a child, the arithmetic £5 in total. We were not able to afford this and the best offer was to watch the Hovercraft. The next day we participated in a coach trip to Snowdon and it teamed with rain and consequently we could only see mist at the summit. These are all cherished memories and Rhyl Hovercraft 50+ gives me a great link to North Wales history. I too was on the beach when the hovercraft landed. My family were on holiday from Broughton at the time. A chap emerged from the craft and waved at us. It was my mother’s cousin Jack who was a petro-chemical engineer on the project. In 2005 a new colleague came to work the school I worked at in Hull and after we’d chatted about ‘stuff’ it transpired she had also been on the beach at the same time and wondered who the chap had been waving to. Small world, eh? I have two blank certificates.